After participating in the National Early Care and Education Learning Collaborative (ECELC), Michele Dixon, Director of A Gr8t Beginning Academy in Carson, California, realized changes needed to happen. She and her staff began educating children on the “ABC’s of a Healthy Me” and incorporated healthy lessons in everyday activities. Staff also began implementing structured physical activity into their weekly lesson plans as well. Every Friday afternoon, the entire center participates in “P.E. Fun Time”. The idea behind each Friday’s “P.E. Fun Time” is to incorporate activities for the “mind, body, and soul.” The staff began developing their own physical activities such as “pumpkin bowling” and “streamer races.” Ms. Dixon organized each week’s physical activities in a “grab and go” lesson plan. The activities, directions and list of supplies are placed in a yellow folder that staff can easily access. When asked to describe her experience, Ms. Dixon said it has been “a supportive, positive change. As a director of an ECE center, there is not really a support group or place to go and get ideas.” She shares that the ECELC program has provided her with resources, support and a place to make connections with others working in the ECE field. 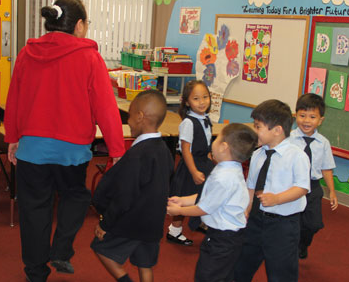 Healthy changes inspired Park Avenue Christian Day Nursery School in Montebello, California, to take its first field trip in 25 years. They visited Future Farmers of America High School where they saw animals and engaged in farming activities. “Healthy Habits for Life” helps you incorporate physical activity and nutrition habits into your everyday activities and is available in both English and Spanish. The guide contains group poems and songs, posters, activities and family newsletters. The familiar “Sesame Street” characters will keep your students engaged as they learn.